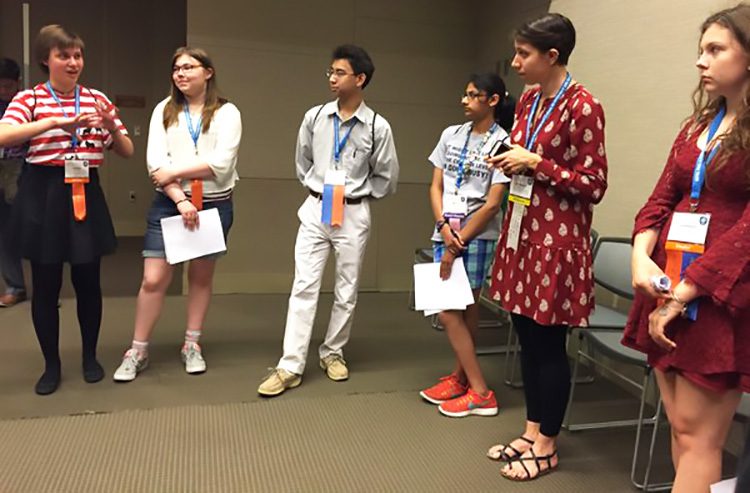 Janet Raloff, editor of Science News for Students, offered advice to Intel ISEF finalists giving their elevator pitches about their projects. PHOTOS COURTESY OF SOCIETY FOR SCIENCE & THE PUBLIC/MARLENA CHERTOCK. Learning how to communicate science research effectively is critical. It's the difference between the public believing in a bunk study and funding the important research that scientists do every day. Science News and Science News for Students editors offered tips and tricks on how to be a great science communicator at the Communicating Science symposium session on Monday at Intel International Science and Engineering Fair, led by Eva Emerson, Editor in Chief of Science News, and Janet Raloff, editor of Science News for Students. "It's important to be able to communicate your work," Janet said. "If you don’t tell why it’s cool, why they should care, people will walk away." There is a fine line between being the expert on a topic and boring the audience, the editors warned the Intel ISEF finalists in the audience. "Identify who you’re talking to," whether it's a child, a judge, or a lay person, as this will change how a project should be presented, said Janet. "Don’t use jargon or try to impress people with six-syllable words. The audience will just become confused or bored." Most importantly, "Be yourself," she said. "Have fun. If you’re a kid, be a kid. Be exuberant and excited about your work. That’s infectious." Bethany offered advice while Intel ISEF finalists explained their projects. The audience of finalists broke into five groups and spread out to different corners of the room, where they gave their elevator pitches about their projects. The editors and staff writers — including Bethany Brookshire, science education writer, Thomas Sumner, earth sciences writer, and Beth Quill, Enterprise Editor — provided instant feedback while they listened. Eva and Janet offered advice like slowing down and making eye contact. If the finalists are talking about an abstract topic, they should find a way to make it more concrete, through metaphor or specific details. They should use sensory words to help the audience understand what they're describing. "Club the audience on the head with your fact first, what you found first, and then open them up for questions," Janet said. Learning how to communicate science research effectively is critical. "If people don’t know what's going on in science, it's hard for them to support it, want the government to fund it," Eva said. "And that’s the only way we can advance human knowledge." Eva shared a real-life example of what can happen when science is communicated poorly to the public. She mentioned vaccine coverage and the subsequent vaccine phobia that erupted. This was based on bad science, and then reporting on that bad science. "It's been hard to convince the public of the truth ever since then. It was based on one study that was since retracted many years ago," she said. Eva offered tips while finalists described their research. Thomas Sumner, earth sciences writer at Science News asked finalists to write out key points of their projects. If the finalists have a personal connection to their project, the editors encouraged them to explain that fully. "Judges will enjoy learning about why you did this research, whether it's because someone in your family had the disease you're studying or you're researching your favorite animal," Janet said. Bethany offered finalists tips like asking the judge "did you get that?" if they want to make sure their audience understands. The editors also passed out examples of STEM articles written for lay people. They explored how to explain difficult concepts to that audience in the session.